The removable side wall was handy for changing damping material. However. there is a price to pay, even with me on top of the speaker the foam is enough to decouple the sidewall from the rest of the box, mechanically. This means most of the box walls and baffles have one long free edge that vibrate and change both output and impedance curves. My finding with the removable side wall was the I was better of with no damping in the pipe and only damping in speaker chamber and IHR. Now for some corner and room measurements. 3.Put horn opening 150 cm from corner, the driver at the front is then quite close to the microphone. The first graph should be here but for some reason it ended up at the very top 3 times in a row. Top orange is near field (150cm out) dip at 90 and 40 Hz visiable. Green is the Audiopro and black the Tangband King compact horn. It looks good apart from the depression 120-200 Hz, if this is due to my deviations from Kings design or not is for others to elucidate. In my living rom, side wall is a proper concrete wall, back wall is a flimsy thing, a similar wall with the Klipsch Corner Horn killed 6-8 dB below 80 Hz as I recall. Not bad at all you clearly hear the kick drum and it suggest some weight, but the "slam" is missing. Higher up the the TB is really good, that peak at 7 kHz does not sound to bad unless you sit straigt on axis. Way better than the Philips 9710. So to conclude (my iteration of the design). It has surprising amount of bass that is dry and well defined not lumpy one note as I feared. The TB have quite a length of cone travel ( I can't stand the rain is really good, grin) with the Fostex that has far less and so the bass output and slam has to bee seen in it's context. In a 25m2 room (300 sqf) I can play quite loud and then the TB run out of steam without sounding harsh or strident. Proper corners are important, I wish I had some! I got some feedback that corner loading should affect impedance and mouth mesurements and to prove me right I measured impedance both in corner and free space and frequency response in horn mouth, this time in a true concrete corner. Really cramped with a large IKEA computer desk close by, but solid walls. 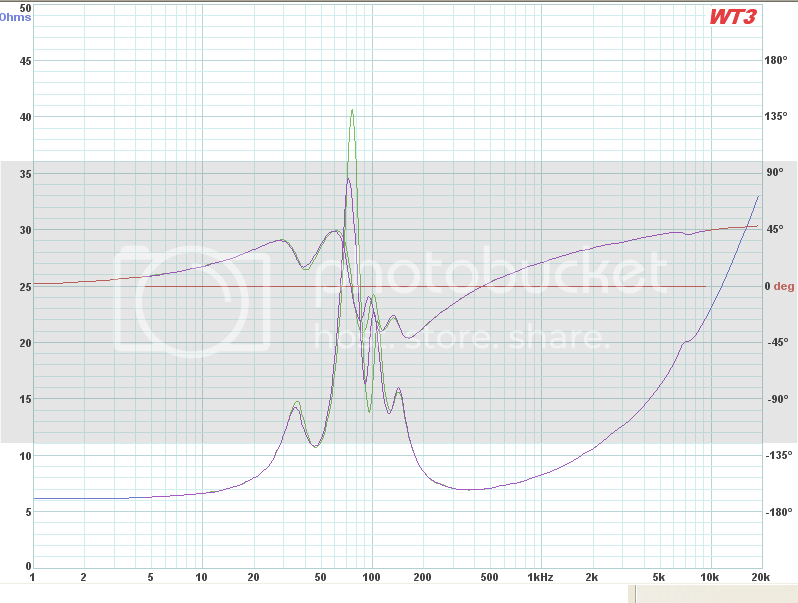 Identical curves below 70 Hz and above 130 Hz but between that more swings up and down in the 70-130 Hz range. Now it looks even better, the output in the 40-30 Hz range is better than other loudspeaker. The are not completly matched, with the bass reflex and horn opening close to the corner the AudioPro Woofer is 40 cm from the corner and about 25 off the floor. The Tangband is a full meter from the corner and 75 cm or so off the floor, so they may add upp differently. A brief listen confirm previous findings, deep bass is there but the slam is not there but I guess that you simply need more cone area to get that effect.